After a lazy day on the couch, I decided to get some fresh air and head over to Chelsea Market to pick up some provisions. What started out with an idea for a simple pasta turned into a three course meal: tuna belly tartare, bruschetta, fresh parpadelle pasta with sardines. It was served with asian black sesame and soy sauce crackers. 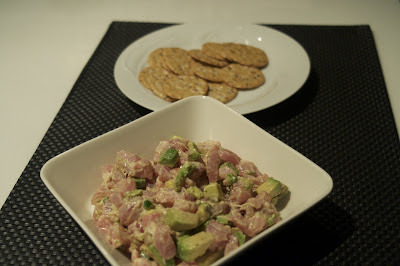 A fantastic combination of creamy, slightly spicy, cool, refreshing, clean flavors. 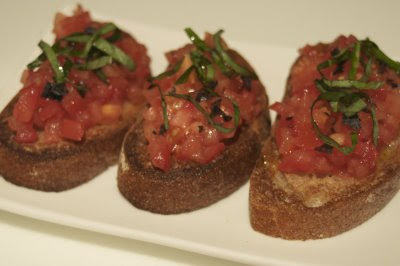 After the tune belly tartare, it was back to my original plan of Italian. Simply toasted Amy's whole wheat bread, rubbed with a garlic clove, drizzled with a peppery olive oil, dressed with chopped tomatoes and julienned basil, sprinkled with Cypruss black sea salt flakes, and drizzled with olive oil again. I had envisioned biting into hot toast with a perfect taste of good olive oil bursting from the toast and this did not miss the mark. 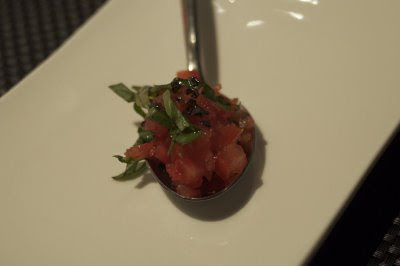 I had some leftover ingredients, so made a quick bruschetta on a spoon - a flavorful bite of tomato, basil, salt, and olive oil. The pasta was my original plan even before heading out to the market, but I really wanted fresh parsley to finish the dish. 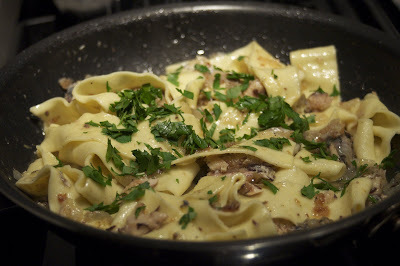 A perfect pasta dish paired with the Firriato 2007 Altavilla della Corte Grillo. The pasta was a lovely combination of the brinyness from the sardines and fish sauce, heat from the pepper flakes, brightness from the lemon juice and zest. The wine was the right weight and freshness to match perfectly.